Miele PG8165 Dishwasher from Gillmans Commercial Appliances. 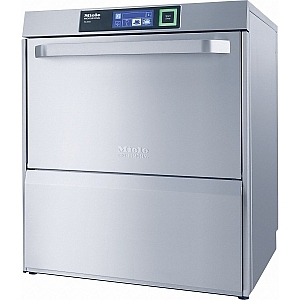 The PG 8165 is a front loading bistro dishwasherwasher perfect for behind the counter use. The PG 8165 has a short cycle of just 55 seconds for glass programmes and 74 seconds for plate programmes. This commercial dishwasher also has a cleaning capacity of 3234 glasses per hour or 882 plates per hour.